This purchase will help support Deaf Children's Literacy Project. 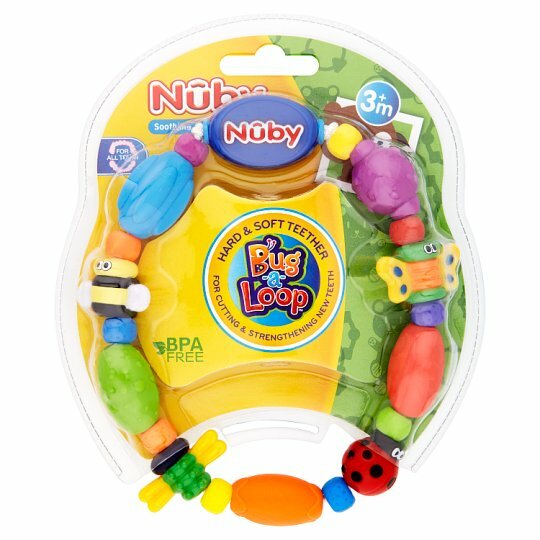 The Bug-a-Loop™ teether by Nûby™ provides textured surfaces for baby to bite and teethe on during teething periods. The teether is engineered with raised offset surfaces that assist in the eruption of teeth by gently massaging infant's gums. Colourful shapes are easy for baby to hold and sized for maximum effectiveness as a teether. Cleaning; Wipe clean only. Not suitable for steam, microwave or cold water sterilisation. Not suitable for dishwashing. Please retain company name and address for future reference. For future reference: Warning! Always use this product with adult supervision. Inspect the teether immediately before and after each use and throw away when damaged or punctured for example by biting. Do not clean or allow to come into contact with solvents or harsh chemicals. Damage could result.